The Nordstrom Anniversary Sale ends this weekend and all the items that have been on sale will go back up to full price! Lots of things have sold out already, or are gone in most sizes, but there are still a few great pieces available. I’m sharing a few of my favorites below – grab them before prices go back up on Monday! **Also, here’s a little PRO SHOPPER TRICK! Some pieces will be restocked after the sale is over, but will now be full price. If there’s any size still available, grab it! Once the sale is over and it’s restocked in your size, go exchange it with your original receipt and they’ll honor the sale price! This jacket was one of the first pieces that caught my eye in the sale. It’s such a unique piece, but still neutral. I’m obsessed. Also there is always a low cut neutral ankle boot during this sale, and this pair from Franco Sarto is the best one I’ve ever seen. 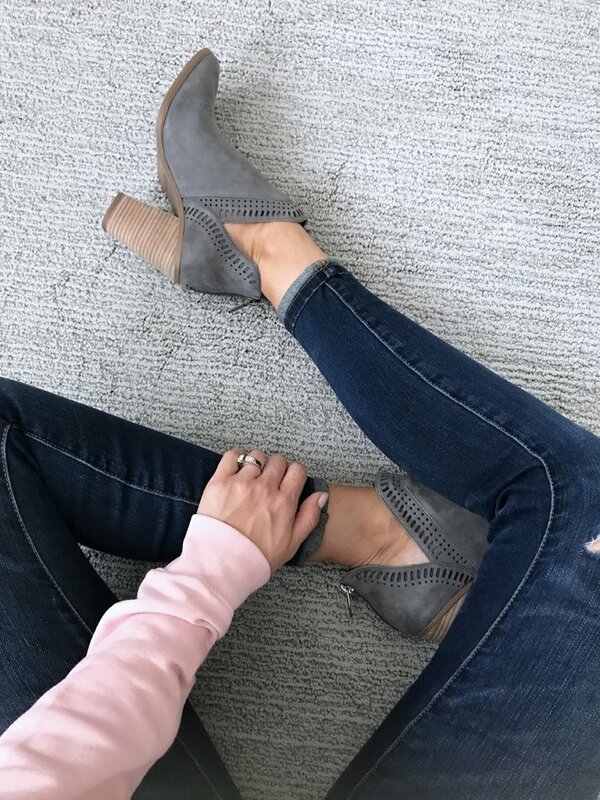 The shape is perfect with a slightly pointed toe, the color is amazing, and the little v-cutout on the side makes it really flattering. These are perfect for fall, all the way into spring. a closer look at the ankle boots worn above! It took me ages to hop on the overall train, but these ones are so good. They’re not on sale, but they’re worth the price and back in stock. I’m wearing the “light stone” color. This striped tee keeps selling out, but it’s currently available in a couple of sizes. I’m wearing a size XS – it runs big, so size down. There’s also a crew neck version right here for $19! These dark teal flats are so pretty — perfect with a white summer dress now, or with plaid in the fall. This gray sweatshirt is insanely soft and under $30! 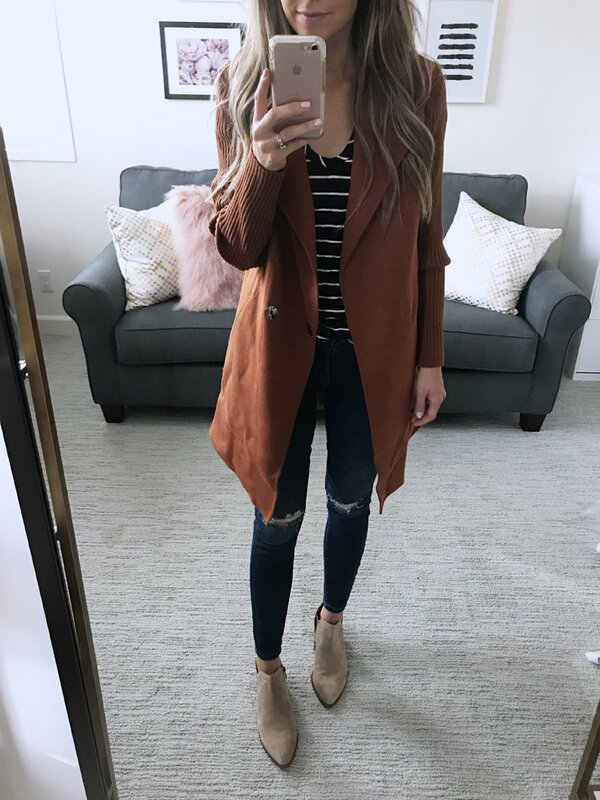 I thought I’d share two ways to wear it — first with jeans and some fun flats, and second to the gym with some leggings! 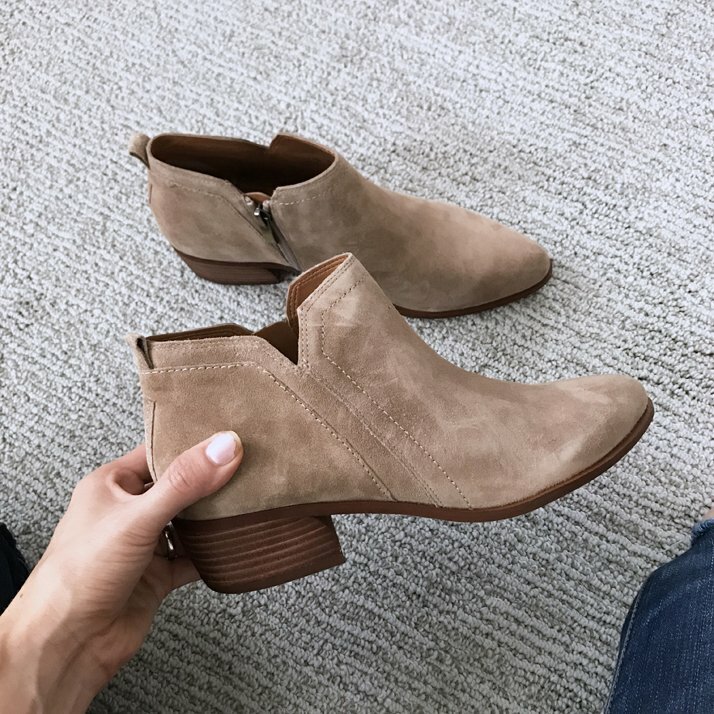 These ankle boots are the perfect dressy pair. They’re really flattering with the low ankle cut, and the cut out detail is so beautiful. They’re also really comfy! 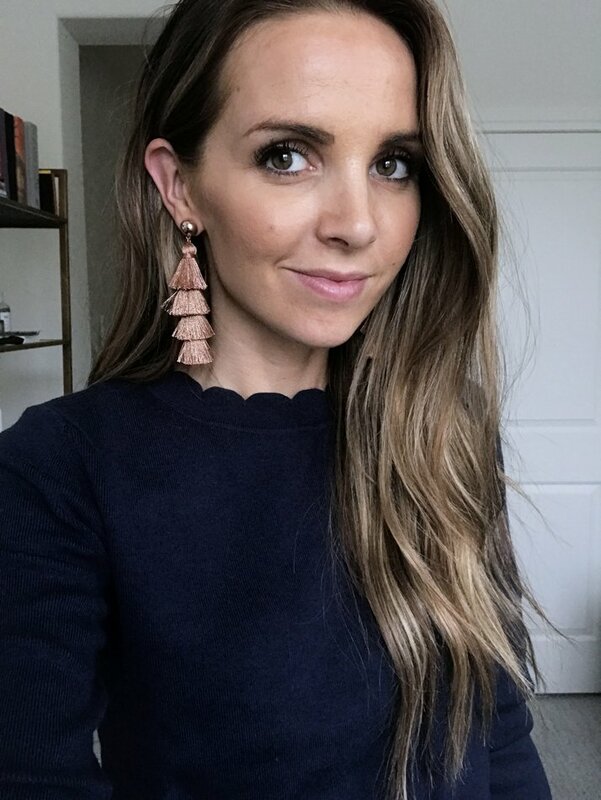 I’m loving a good statement earring right now. These tassel ones are so fun, and are perfect with this navy scalloped sweater. This sweater was one of my favorite purchases from the sale. It’s under $25 and such a good staple for Fall. It keeps selling out, but it’s currently available in a couple of sizes! These studded bow flats are such a good staple for year round. I love the contrast of the studs and the bow – such a good sweet and edgy combo! You can see me wearing them here. 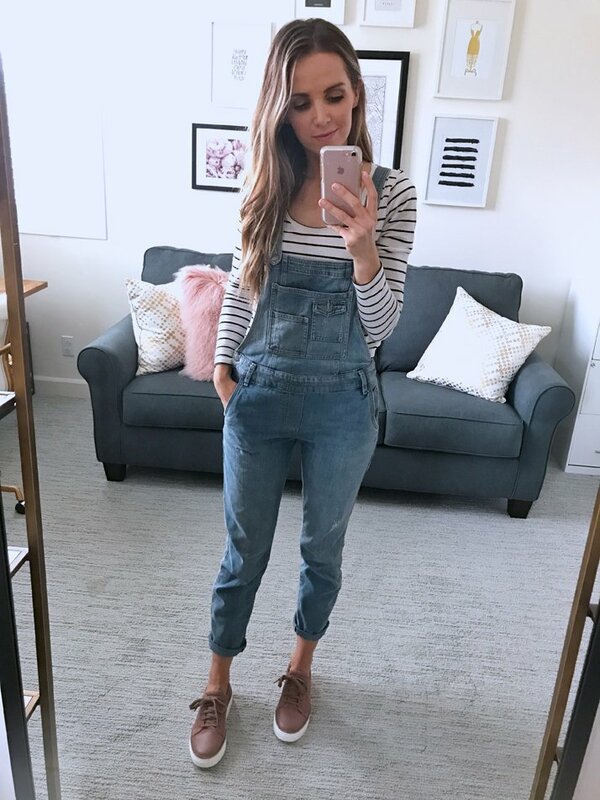 Those Free People overalls are amazing! I’m really trying to fight the urge to get them!